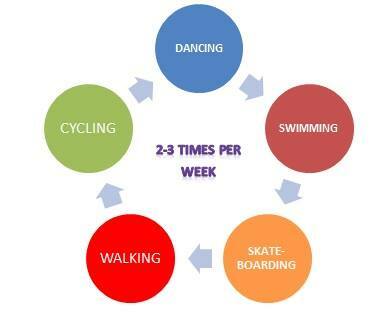 2.1 What is physical activity and how much is enough for my child? 2.2 More benefits of physical activity! 2.3 Can exercise and sport hurt my child? 2.4 What can happen if my child doesn't exercise? 2.4.1 Interested in some facts about inactivity? 2.5 How much exercise do parents and grandparents need? 3.3 What's Key To Remember? The aim of this online resource is to provide parents of children with physical disabilities with information regarding the importance of physical activity in their child’s lives. It offers a guide to the sporting and recreational opportunities available for children in Edinburgh and the Lothian area. The following page will talk about the health benefits of physical activity. It also looks at what may prevent your child from being physically active, and what support and opportunities there are for you and your child. It hopes to cover all the key information that parents would require, so that their children can take part in the variety of physical activity opportunities that is available to them. Throughout this resource, your thoughtful guide Theo will share some of his thoughts and encourage you to start thinking about certain topics. "Hi my name is Theo and I am going to help guide you through this online resource!" 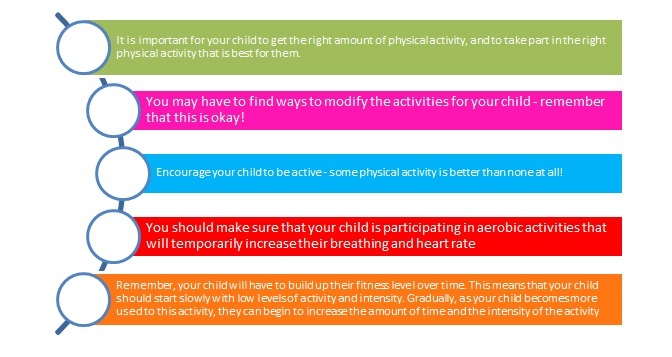 What is physical activity and how much is enough for my child? Did you know that physical activity is any movement made by your body that uses energy? 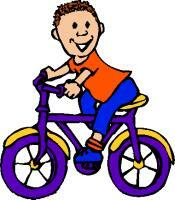 Your child should aim to take part in at least one hour of medium to hard intensity physical activity every day. These are types of activities which may make your child work up a sweat. Taking part in these activities will speed up your child’s heart rate and will warm up their body for further activities. They will also leave your child feeling a little out of breath; but don’t worry, it is completely normal. An example of such activities are laid out below. These guidelines are set out for children in general. If your child has a disability or medical condition, activities and exercises should be adapted according to what they can do. If you want to more know about the type of activities available and what level of intensity they should be performed at, click here. If you still feel uncertain about the amount and types of exercises/activities that are best suited for your child’s need, contact your local GP or physiotherapist for more specific advice. Did you know that individuals living with disabilities were 82% more likely to take part in regular physical activity if a health professional advised it? More benefits of physical activity! 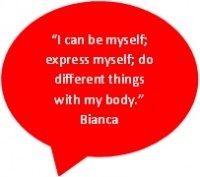 It will make your child feel more confident about themselves – you will notice that they feel happier! Active wheelchair users are less likely to have pressure sores and kidney complications than those who don’t take part in much physical activity. Physical activity plays an important part in maintaining good fitness and it lowers their chances of getting a lifelong illnesses and/or other health conditions. Can exercise and sport hurt my child? Did you know that manual wheelchair users often feel pain around their shoulders? This is because shoulders are naturally made for moving around rather than for constantly lifting and pushing lots of weight! The day-to-day life of a person who uses a manual wheelchair often involves a lot of pushing and lifting; from pushing themselves around all day to lifting themselves into and out of their wheelchair. This means that if your child injures their shoulder, it may really limit the amount of things they can normally do for themselves. How can they injure their shoulder? The same way everyone else can! Many injuries can happen from carrying out a shoulder movement for a specific task that is difficult to complete. For example, lifting a very heavy object over your head. You can also hurt your shoulder by repeatedly performing a normal movement so often that your joint begins to wear down. Activities like pushing your wheelchair a long distance or transferring in and out of your wheelchair many times throughout the day. This is called an overuse injury, because your shoulder becomes overused without having enough time to rest and heal. Now you may be thinking, “well if my child may hurt their shoulder from overuse, does that mean they shouldn't play any sports which require a lot of shoulder movement?" This is definitely a valid question and there is no definitive answer. While it is very important to pay close attention to how your child's joints are coping with the stress of physical activity, exercises to strengthen muscles around these joints can also help protect them. When managed correctly, an active wheelchair user is less likely to have shoulder pain than a sedentary one. In fact, a sedentary wheelchair user may develop shoulder pain up to 4 years sooner than a wheelchair athlete! Getting exercise through sports is a great way to help strengthen your child’s muscles. Making sure their muscles and joints are strong means they will have the best chance at living independently, and goes a long way to improving their overall wellbeing! What are some other common injuries and young wheelchair athlete may encounter? Here is a list of a few things to watch out for, with some helpful tips on how to avoid them! 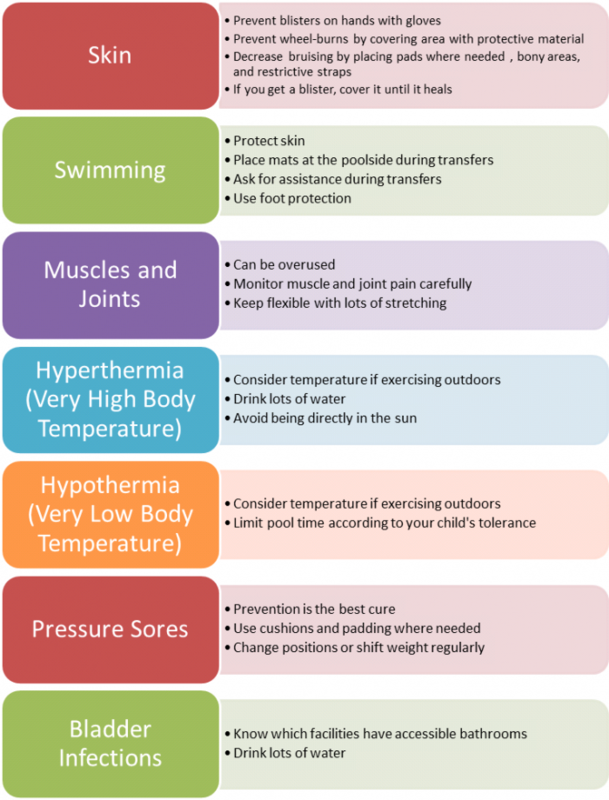 "Have a think about whether your child is prone to any of these injuries. Can you think of any other injuries not listed here? How prepared are you to prevent these from happening?" What can happen if my child doesn't exercise? Now let’s take a look at some of the more serious health risks linked to inactivity. Not taking part in enough physical activity is one of the biggest risk factors for death around the world. Individuals with disabilities have a 3 times higher chance of having health-related problems than individuals who do not have disabilities. Thankfully, exercise can help lower the risks of having these problems. People who are less active have a 20-30% higher risk of death compared to people who are more active. Physical inactivity can also lead to feeling more tired and down, putting on more weight, becoming more dependent on others. Physical inactivity also increases the risk of heart disease, type 2 diabetes, high blood pressure, stroke, pressure sores, weaker bones, depression and several cancers. Interested in some facts about inactivity? How much exercise do parents and grandparents need? Now that you are more aware of how important physical activity is and how not being active enough can affect your health, take a moment to think about where you are in terms of your own physical activity levels and where you want to be. Aim to take part in 150 minutes of medium intensity physical activity in throughout the week. Other options are to try for 75 minutes of hard physical activity or to complete a combination of both. If you want to go that extra mile, you should work towards 300 minutes of medium intensity physical activity per week. Exercises to strengthen your major muscles groups should also be completed at least twice a week. Aim to take part in 150 minutes of medium intensity physical activity in throughout the week. Another option is to try for 75 minutes of hard physical activity. If you are not confident in your ability to move around, you should still try to take part in physical activity three times a week. It is known to improve balance and prevent falls. Exercises to strengthen your major muscles groups should also be completed twice a week. The intensity of physical activity depends on the activities you take part in. In order to boost your heart health, all activities should be performed in periods that last at least 10 minutes. By now you are well aware of how important it is for everyone to take part in physical activity, but we all know it’s not always that simple when your child has additional support needs. You may find a number of things get in the way when you are trying to enable your child to take part in activities. Your child’s disability may make taking part in physical activity more difficult as it may limit range of movement at joints, flexibility, agility, strength or endurance. Your child may also have issues with balance and coordination; if they do, you might find that they have a fear of falling when engaging in sports. Any of these limitations, may demotivate your child from taking part in more activities. Pain and/or fatigue may also limit your child from being active. It can often be due to overtraining, sitting for long periods or wearing their assistive devices such as an orthosis. Your child may take more time to go outdoors during school breaks if they have to handle and wear orthoses. They may see it as an inconvenience and may stop using this time to play outside with their friends. Physical strength and skills that your child has developed may be lost due to interruptions in training or recovery after surgery. As your child gets older, the gap between able-bodied children and disabled athletes in terms of physical strength and agility grows larger. With this, the skills gap also widens and sports become more competitive. As a result, it may become more difficult for your child to continue taking part in mainstream activities. Embarrassment, vulnerability, disappointment and shame at appearing physically incapable are just some of the uncomfortable emotions your child may experience. These feelings may lower their confidence and self-esteem. They may also feel frustrated at taking longer to learn a new skill and as a result, may avoid taking part in certain activities altogether. Negative attitudes from parents, staff and peers can hinder your child’s interest in physical activity. It may come in the form of teasing from other children and/or teachers who lack training in adapting activities to suit your child needs. This also results in excluding them from taking part in school clubs and activities. As a result, your child may feel singled out and alone. These feelings can sometimes lead them to believe they are not good enough and can make it more difficult for them to persevere with physical activity. Finding time in the midst of appointments with various therapists, school runs, caring for other children, along with day-to-day duties poses as one of the main barriers to including physical activity in your child’s life. With the extra expenses of caring for a child with a disability and fewer earnings due to taking on caring responsibilities instead of work, there is often little money leftover to spend on membership for various classes and clubs. Sporting opportunities specific to your child’s abilities, as well as those available in your local area are often poorly advertised. Lack of available information means you may have to rely on word-of-mouth or carry out your own research to learn about new opportunities for your child. Sporting facilities that cater for your child’s needs are often lacking in certain areas such as shortage of qualified staff willing to supervise activities for children with motor impairments and lack of equipment to aid sports, especially as your child gets older. children to make up teams or finding other teams to play against. With this comes the barrier of transport. Living far away from such facilities and having to travel to introduce your child to such activities, may not be always be easy to access via public transport. One off programmes as well as long waiting lists for specialised classes may also pose as a barrier to your child’s participation in physical activity. Specialised adaptive equipment for sports is also costly and not always readily available. Environmental barriers may also get in the way to accessing sporting facilities. These may include lack of curb cuts and ramps, doors being too narrow for wheelchair access and reception desks being too high to talk to staff. "Something to take note of...As a parent you may presume your child is meeting their daily physical activity requirements during play time in pre-school. However, much of the free play in pre-schools involves seated activities, so make sure you include some physical activity after school time as well." Do you feel you can identify with some of these barriers? Here are some ways in which you can motivate and help enable your child to engage in sports and other activities. The health benefits of physical activity may not be motivating factor for young children to exercise; however, finding an activity that provides fun and enjoyment is very important in facilitating and maintaining a physically active behaviour. The sensation of speed is something that children have reported as an enjoyable feeling, thus proving to be an internal motivator. Therefore providing your child the opportunity to experience this feeling, be it through running, swimming, dancing, cycling, rolling on a ball or bouncing on a trampoline can be a key start to introducing a physically active behaviour in your child. The feeling of being physically capable, along with the sense of achieving mastery in their chosen activity is crucial to improving self-efficacy; a important factor in adopting a physically active behaviour. Finding activities that your child feels they can perform independently and well provides them with a sense of pride and accomplishment, further motivating them to be physically active. Since children also enjoy “showing off” every now and again, playing games with a competitive spirit can often be a good way to get them involved in physical activity. Desirable changes in body image along with improvements in physical function, such as becoming stronger, fitter and more agile can be a big motivator for your child. It can improve their ability to move around and thus become a vital motivating factor as it allows them to become more independent, gives them a sense of ownership over their own body and may also reduce the need for occupational therapy and physiotherapy. Studies haven shown that children (aged 4-7) of physically active mothers are twice as likely to take part in physical activity than children with inactive mothers. The are also 3.5 times more likely to engage in physical activity if they have active fathers. Those with two active parents are almost 6 times more likely to be physically active than children of inactive parents. As a parent, you are the most influential role model to your child. That’s why your own behaviours and the value you place on physical activity will directly effect the level of your child’s participation in sports and activities. If you have managed to introduce a physically active lifestyle from a young age - that’s great! However, maintaining this lifestyle can be challenging as your child grows older. Parental support is also thought to be a key factor in maintaining physically active habits. Thus, the importance you place on your child’s physical activity levels, along with the encouragement and support you provide is vital in facilitating your child to maintain an active behaviour. This involves your willingness and ability to provide transport to practices and competitions, and showing support and appreciating their achievements in order to aid participation. As a parent, you are also in charge your child’s daily schedule. Why not reduce screen time during the day and encourage your child to go outside and play? 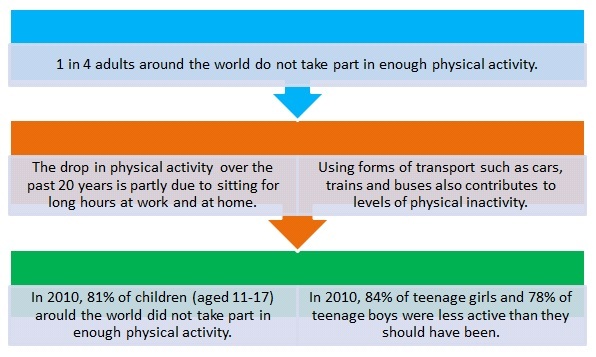 Factor in the time taken to go to the park or a class to include physical as a daily requirement. Habits of friends and siblings can also impact your child’s decision to take part in activities. Children enjoy belonging to something or someone; taking part in activities with family and friends can give them a feeling of togetherness and of being noticed and accepted as part of a group. It also gives them the opportunity to meet others with similar abilities and most importantly to be seen as more than their disability! As mentioned, cost can be big barrier to taking part in sport; therefore, this section will guide you to organisations, foundations and trusts in Scotland that can financially support your family and enable your child to take part in the sports and activities of their choice. Sports Aid Scotland gives grants to talented young adults (aged 12-22) who take part in sports and disability athletes (aged 22-45) who are representing Scotland at a national level. The grant covers costs for training and travelling. DBA supports anyone with a physical disability regardless of their abilities; they have helped complete beginners as well as Paralympains by offering financial support for specialist training, equipment, and competitions. You can apply for a transport grant from ECAS Edinburgh to attend their tai chi, yoga and swimming classes. If you are a parent/carer of a disabled young person (aged 20 and under) who lives at home, you can apply for a grant from Take a Break. It can be used to cover costs for outings, leisure activities and sporting equipment. Grants are usually from £200-400 and have previously been used for gym memberships, horse riding and football equipment. The Stanley Morrison Trust supports charities and community groups by sponsoring events that encourage young people to become more active. No exclusion criteria was provided. Get Kids Going! enables young people (aged 26 and under) to take part in disability sports by providing funding for specialist wheelchairs. They accept applications from individuals of all abilities - from complete beginners right up to Paralympians. The charity also gives sport grants to cover the costs of training, travelling, physiotherapy and competition fees. The Adam Millichip Foundation helps cover costs for disabled people who want to improve their quality of life by taking part in sports and activities. However, they do not fund gym memberships. To apply here, your child needs to have the following: contact details, funding information and a personal statement. Proof of their disability by a doctor is also needed, but this letter can be provided later. Set up in memory of Richard who had Duchenne Muscular Dystrophy, the Richard Overall Trust supports disabled children and young adults to engage in and enjoy sport. They provide funding for training, sports clothing, transport, specialist equipment and sporting event tickets. Applications can be made by individuals, groups, families and carers. They also need a supporting letter from either a physiotherapist, occupational therapist, GP or teacher. You can download the application form from their website. The Dan Maskell Tennis Trust supports disabled people that wish to play tennis by providing grants for specialist wheelchairs. They are accept applications from individuals, clubs, schools and active disability programmes. You can complete the application online or by hand. 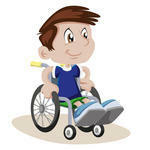 Wheel Appeal provides new sport wheelchairs, training and coaching for disabled children and adults. They help cover the costs of manual sport wheelchairs, hand cycles and hockey sledges by providing grants of up to £1,500. Applicants may be asked to contribute £250 towards their equipment. To apply, you need to sign up for a free membership on Wheelpower. Once you have completed your child’s application, it needs to be supported by a statement from a recognised sport club, school, sport body or spinal unit. Caudwell Children provide funding for sporting equipment for young, disabled individuals (aged 19 and under). They only accept applications from children of families with an annual income of £45,000 or less. They also need a letter from the club/coach for proof of involvement in a sport and from a health professional for confirmation of disability. The Adamson Trust helps cover costs of holidays and respite breaks for children with disabilities (aged 17 and under). The planned holidays have activities such adapted abseiling and canoeing. You can download the short application form from their website; the application must be completed and sent off by 31st December, 2016 in order for it to be discussed at the meeting of the trustees in February. Are you planning a holiday? If you want to learn about funding for respite holidays and applying for family holiday grants then head over to disability-grants.org. As a parent, regardless of whether your child has a physical disability, you will often worry about how to provide the best opportunities for your child. By now, you should know that physical activity plays a very important part in every person’s life. Take a moment to think about how active you are as a family. Every family is different. Some families lead very active lifestyles, but find it hard to include their child when taking part in certain activities. Others may be a lot less active and then the challenge becomes even greater. This section will explore a number of different sports and activities. It will also direct you to the opportunities out there for your child and family to become more physically active. Prices: Standard £5, Discount card £3.75, Junior and Disability Discount card £2.50. Go to their website and book some sessions! If you stay in Forth Valley, there are a few swimming clubs that you can look into for your child. Enable Arion Swimming Club train at the Peak Sports Village in Stirling on Thursdays from 7:00pm - 8:00pm. For further information contact Moria Williamson by telephone (07523 132 144). Dolphin Swimming Club meet up at Grangemouth Sports Complex every alternate Saturday. For training times and more information contact Shirley Jenkins by telephone (01324 504560). Stirling Swimming Club train at Stirling University on Wednesdays and Fridays from 6:30pm - 8:30pm. Prices: £50 for annual membership, £25 per month. For more information contact Ilona Shilliday by email ([email protected]). Does your child prefer a team-based sport perhaps? Why not give wheelchair basketball a try? Playing this fully inclusive, fast-paced game is a great way for your child to stay physically active, build their self-esteem and make new friends. To get in touch with LPWBC and learn more about the rules of wheelchair basketball, visit their website. To book a taster session and learn more about the classes at JJC, head over to their website or call 07411 722240. Prices: Free first session, then £4 per session or £25 for an annual membership. Prices: £4.40 per session for Juniors, £4.40 per Additional Support Needs session for Adults, £5 per Wheelchair session for Adults. Call 0131 443 0101 or email Anna Myatt ([email protected]) to arrange a FREE taster session. If you want to know more about WWWTC, go to their website. If you stay in Forth Valley, Stirling Tennis Club has sessions on Saturday afternoons that are open to all school-aged children with a disability. For further information, please contact Hannah Pickford by email ([email protected]) or telephone (07986221506). What if your child wants a mixture of different sports? What happens then? Well, No Limits Sports Club is a club for children and young adults living with a disability. The only issue is that it is not well known to all of you out there. It is based at the Linlithgow Leisure Centre and includes sports such as boccia, badminton, carpet bowls, table tennis, archery, football. To make it sound even better, the attendance fee for your child is £2 and siblings go for £1.50. Why not make it a family outing? If you don’t believe it, head to this website and have a look at what the club goers have to say about it. If you live in Forth Valley, the 2020 Club offers multisports to young people (aged 10-18) with a physical or sensory disability. Sessions are held at Larbert High School on Saturdays from 1:00pm - 3:00pm. To get in touch for further information please contact Graham Harvey by email ([email protected]) or by telephone (01786 466486). Central Wheelchair Multisports Club also offers Wheelchair Basketball and Wheelchair Tennis for young people. Sessions are held at Stirling University on Mondays from 4:00pm - 6:00pm. If you are interested in joining the action, please contact Mitchell Graham by email ([email protected]). Do you live near or frequently visit Ocean Terminal Shopping Centre in Leith? If so, then why not enjoy a nice walk along the water where the Britannia is docked. It's less than a mile, mostly flat and ideal for buggies and wheelchairs. Perhaps after a day of shopping in Ocean Terminal, you could head down there for the fresh air and stunning view. For those of you who still don’t know where it is, pop EH6 6JJ into maps on your phone or your GPS and it should lead you next to the blue car park of Ocean Terminal Shopping Centre. This is another scenic walking route that you and your family can enjoy in Edinburgh. It's mostly flat and quite short, but it’s accessible to people using wheelchairs. So, if you are willing to get out and take part in some exercise, head over to the Meadows off Melville Drive on the A700 with your entire family. This wonderful walkway passes through many areas in Edinburgh such as Stockbridge, Royal Botanic Gardens, and Scottish Gallery of Modern Art. It's ideal for family strolls as it’s a great getaway from the hustle and bustle of city life. This route is suitable for cycling and can be accessed in part by wheelchairs and even by horseback! If you are keen on planning a trip with your family to explore this route, visit here and download the PDF of the walkway map. "If you thought it was impossible to push a wheelchair on the sand, think again." Beach Wheelchairs is a Scottish Charity that makes it possible. They believe that everyone has the right to enjoy the beautiful beaches Scotland has to offer. 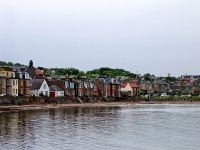 This amazing charity provides beach wheelchairs and walkers for children and adults which can be collected from the Beach Hut at North Berwick Harbour in East Lothian. Not only that, if you want to, you can loan a beach wheelchair for free! If you're wondering how to book this fantastic opportunity, all you have to do is keep reading. How to book: Call 03001112112 to discuss the available equipment and book a session which suits you. Sessions can be held in the morning, afternoon or evening, every day of the week. For more information click here. Did you know that the RBGE has wonderful gardens and glasshouses, an art gallery, a visitor centre and some restaurants? The gardens are largely accessible to wheelchair users and the all the buildings have level or ramped ground floor access. Also, any steep paths which are not wheelchair accessible are signposted and garden staff can advise you on the glasshouses that are not accessible. This will prevent any disappointments! If you visit their website, you can read more about the access to the gardens you want to see. If you are a lover of plants, science, and horticulture and would like to share this love with your child and family, then why not get front row seats to their world class living collection? If you have family or friends visiting from other parts of the world, perhaps a walking tour of Edinburgh is just what you are looking for. Due to the prices, this may not be an option for everyone; but it's definitely worth knowing about. The tours run 7 days a week and an 8-hour tour costs £360 for 2 people or £420 for a group of 4. The highlights of the tour include the Royal Mile, Princes Street and Holyrood Palace to name a few. The walking tour also takes time out for some lunch. If you are interested in finding out more or booking a tour, click here! Learning to ride a bike is part of a normal childhood; but, as you may already know, for some children this is not always possible. No child should have to be told that they can never go for a bike ride; and thankfully, with the development of adapted bikes it should no longer be an issue. Yet as a parent, you are probably wondering whether you can even afford one of these specially designed bikes. Well, you will be happy to hear that there's a cycling hub in Edinburgh where bikes can be used daily/weekly. Not only will this recent project provide more opportunities for you and your family, but it will also support the growth and learning of your child. FABB/Blazing Saddles is a mobile all-ability cycling initiative. They provide cycling for disabled people by lending adaptive bikes and equipment through 12 local hubs. Luckily, there is a cycling hub right here in Edinburgh! The aim of this fantastic initiative is to challenge barriers and improve access for disabled individuals, so that they can take part in social, leisure and educational activities of their choice. Cycling may, be something your child would like to participate in and Blazing Saddles makes it much more possible for them. They have a range of adaptive bikes, trikes, side by sides, hand-cycles, wheelchair transporters and standard bikes of different sizes. All sessions are supported by trained staff and volunteers to ensure that everyone can enjoy cycling regardless of their age, backgrounds, experience or ability. All sessions are FREE and new riders should get in touch to arrange a first visit for a trial of the bikes. This will be a great chance for you and your family to enjoy cycling together. They also has a Facebook page and Twitter account so that you can follow all the updates. Have a look at the attached flyer below for contact details and more information about this amazing opportunity. If you have a burning desire to enrol your child in a riding school then who is to say it’s not possible? Or, has your child ever expressed their wish to ride a horse, but you think it’s impossible? Riding for the Disabled Association (RDA), is a national charity set up to provide therapy, achievement and most importantly, fun. Dedicated physiotherapists, staff members and volunteers work regularly with horses and ponies to fundamentally improve the minds of 28,000 people across the UK. Luckily, the RDA has a few sites here in the Lothian area. Unfortunately, due to the costs of horses and the growing demand, most place have waiting lists. Did you know that riding creates friendships, helps muscle coordination, builds self confidence and is great fun? Muirfield Riding Therapy (MRT) is a riding school that operates 7 sessions per week. It is open to children, teens and young adults, for FREE; however, you do have to apply before you show up. All you have to do now is go to MRT’s website and complete the form. In some instances, you may even get a referral from your GP. If MRT seems far away, Thornton Rose is another option for you. This riding group provides opportunities for people of all ages and disabilities to enjoy a safe, stimulating and therapeutic activity. Although Thornton Rose is the only group based in Midlothian, it is open to everyone in the Lothian area. Interestingly, not all participants are riders; some members come and care for the horses while others do chores around the stables. Sessions are FREE and usually last about 30-35 minutes. During this time, parents and carers are asked to stay in the yard, but are also welcome to ride with their child for the first few weeks to settle them in. To further entice you, there is a caravan in the yard with tea and coffee! This all sounds perfect right? Unfortunately, the waiting list can be quite long. Participants also need to be matched to particular horses and the amount of time this may take is unknown. For some this wait is short, but for others, it may be several years. Golf may not appeal to most of you, but for those of you who are interested, there's an opportunity for you and your family to enjoy a round of golf at the 12-Hole Hermitage Family Golf Course here in Edinburgh. Known as the first course of its type in the UK, it enables people living with disabilities to enjoy a game of golf at their own pace. This fantastic golf course is located in Braid Hills Drive and caters for the additional support needs your child may have. If that hasn’t persuaded you, a resident PGA golf professional offers private and group sessions. Golf camps are also held all year round and there’s an open-to-all coffee house on site. For more information don’t hesitate to visit their website. Prices: For the day, family (up to 4) is £22, child (up to 16 years) is £4, parent and child is £10, full membership is £275. If you are keen to get your child involved in golf, there are locally based PGA professionals who offer lessons. Prices range upward of £20 per half hour. Scottish Disability Golf, which supports golf for the disabled person in Scotland, have also used professionals at Melville, Duddingston, Dalmahoy and Houston in recent months. Has your child ever wanted to zoom around the track like the superhero Flash? Race running might just be the sport for them. A recognized international disability sport, race running involves running around the track with the support of a specialised bike. Race Running is a fantastic way for your child to improve their overall fitness, strength and well-being. Although there are currently no active Race Running clubs within the Lothian area, there may opportunities in the near future. In the meantime, your child can get fitted for a running bike at all-ability cycling hub based in Bangholm Outdoor Education Centre and whiz across flat walking paths. For further information on getting fitted for and renting running bikes, contact David Glover at the All Abilities Bike Club by telephone (07500 069357) or email ([email protected]). For further information contact Ann Finlayson by email ([email protected]). If you thought things could not get any more fun, they just have! The Yard is a purpose built indoor and outdoor adventure playground for children and young people living with disabilities. It lies in the heart of Edinburgh and, quite simply could not cater for people with additional support needs any better than it already does. This is a place for your whole family; it will give you and your children the chance to explore your surroundings and interact with others. Most importantly, your child will make new friends who won’t look at them differently and who experience the same struggles they do. Prices: £5-7 per month, for visiting members £15 (5 visits) and £25 (10 visits) per year. For more information, visit their website or call 0131 476 4506. Did you know that you can get a great workout from dancing? If your child enjoys watching 'Strictly Come Dancing’ and moving along to music, why not head over to Dance Base? Price: The sessions are £6 and support workers are encouraged to join the fun at no extra cost. Although they do not have any specifically designed classes for children with disabilities (aged 14 and under), they are happy to make adjustments where possible. For more information on timings and prices; or even just to book classes 24 hours check out their website, call 0131 225 5525 or head over there in person. Did you know that everyone in your family can enjoy getting physically active from your very own living room? Active Video Gaming (AVG) can be a fun way for your child to get themselves moving. Investing in a safe and user-friendly gaming console such as the Nintendo Wii or XBox360 with Kinect will enable everyone in your family to take part in AVGs. Where Nintendo Wii uses handheld remotes and ‘nunchuks’ to activate the motion sensors, the XBox360 with Kinect uses a camera and sensors to track movements. Once you have your chosen gaming console linked up to the television and a game, all your child needs is some space and they are set to play. Here are just a few games that you and your child can play together. Depending on what your child is interested in, there are plenty of other games out there for you to choose from. This standard game for the Wii offers five different sporting experiences - boxing, tennis, golf, bowling and baseball. The more recent release Wii Sports Resort offers twelve sporting experiences including archery, swordplay and canoeing. It is best suited for anyone aged 7 or older and four family members can play at the same time (depending on the number of remotes). This Kinect game can be played by anyone aged 3 or older. It offers six different sporting experiences - volleyball, boxing, bowling, football, athletics and table-tennis. The more recent release Kinect Sports: Season 2 offers six other sports including tennis, darts and baseball. Kinect Rush: A Disney Pixar Adventure - If your child is a fan of Disney, they might love playing this one. Using their arms, they can command their on-screen characters to throw, steer, swing, climb and run in various movie-based games. If you are interested in knowing more about which consoles and games are best suited for your child, talk to the salesperson in the store. To sum it up, physical activity is hugely important for us all, and children with physical disabilities are no exception. Unfortunately, children with disabilities are less active than their able-bodied peers and therefore encouraging their participation in sporting and recreational activities is vital. In this online resource we have talked you through the various physical and psychological advantages of being physically active such as, but not limited to improvements in body function, heart and bone health, psychological wellbeing and social engagement. We have informed you on just how much exercise your child and each member of the family should be achieving in order to help prevent or delay the development of long-term conditions. We have identified the main barriers to taking part in physical activity such as, but not limited to lack of motivation, time, cost and a shortage of available facilities. We hope that by making you aware of these, you will be better equipped to plan ways to overcome them. We have also discussed the key facilitators and motivating factors to participation including the sense of achievement, social inclusion, and most importantly having fun! We hope to have emphasised the importance of your role as your child’s parent and advocate in aiding their participation; including the influence of your support and own physical activity levels. Most importantly, we hope that after reading this we have saved you some time researching about opportunities and helped motivate you, your child and your family to get out and get active. We are aware that new opportunities are born every moment and we welcome others to update the page if they are aware of other clubs and classes that currently exist or know of new ones that are just starting out. The opportunities on this page are just several of many different sports and activities you can get your child involved in. Let’s get active! You may find the following organisations to be useful. Lothian Disability Sport is a charitable organisation that aims to develop, support and provide sporting opportunities for people with a physical, sensory and learning disability in Edinburgh and the Lothians. They organise, plan and develop annual junior and adult programmes in partnership with the local authorities. They manage Lothian teams to Scottish Disability Sport National events by organising transport and selecting athletes that qualify from regional events. They also give grants aid supports for specialised equipment, athlete training, transport aid and support to diability specific clubs. To find out more about Lothian Disability Sport check out their website. Forth Valley Disability Sport is a charitable organisation that aims to develop, support and provide sporting opportunities for people with a physical, sensory and learning disability in Stirling, Clackmannanshire and Falkirk. They organise, plan and develop annual junior and adult programmes in partnership with the three local authorities: Active Sitrling, Clackmannanshire Council and Falkirk Community Trust. They manage Forth Valley teams to Scottish Disability Sport National events by organising transport and selecting athletes that qualify from regional events. They also give grants aid supports for specialised equipment, athlete training, transport aid and support to diability specific clubs. To find out more about Forth Valley Disability Sport check out their website. These are some additional resources that are worth checking out. Go have a look when you have a spare moment. ↑ 1.0 1.1 Physical Activity. World Health Organisation. Available from: http://www.who.int/mediacentre/factsheets/fs385/en/. [Accessed 16th November 2016]. ↑ Physical Activity Guideline for Americans. U.S. Department of Health and Human Services. Available from: https://health.gov/paguidelines/pdf/paguide.pdf. [Accessed 17th November]. ↑ 4.0 4.1 4.2 Emck C, Bosscher R, Beek P, Doreleijers T. Gross motor performance and self‐perceived motor competence in children with emotional, behavioural, and pervasive developmental disorders: a review. Developmental Medicine & Child Neurology. 2009, Jul 1;51(7):501-17. ↑ Moone MS, Renzaglia A. Physical fitness and the mentally retarded: a critical review of the literature Journal of Special Education. 1982;16(16) 3: 269 -287. ↑ Nishiyama S, Kuwahara T, Maatsudea I. Decreased bone density in severely handicapped children and adults with reference to the influence of limited mobility and anticonvulsant medication European Journal of Pediatrics. 1986; 144(5): 457-763. ↑ Lancioni GE, O'Reilly MF. A review of research on physical exercise with people with severe and profound developmental disabilities. Research in Development Disabilities. 1998; 19(6): 477-492. ↑ Washburn RA, Zhu W, McAuley E, Frogle M, Figonis SF. The physical Activity Scale for individuals with physical disabilities: Development and Evaluation. Archives of Physical Medicine and Rehabilitation. 2002; 83:193-200. ↑ Nary DE, Froehlich AK, White GW. Accessibility of fitness facilities for persons with physical disabilities using wheelchairs. Topics in Spinal Cord Injury Rehabilitation. 2000; 6(1): 90-101. ↑ 12. Fentem PH. Education and debate ABC of Sports Medicine: Benefits of exercise in health and disease. British Medical Journal. 1994;308:1291-1295. ↑ 13.0 13.1 13.2 13.3 13.4 13.5 Fullerton HD, Borckardt JJ, Alfano AP. Shoulder pain: A comparison of wheelchair athletes and nonathletic wheelchair users. Med. Sci. Sports Exec. 2003. Vol 35, No 12, pp. 1958-1961. ↑ 14.0 14.1 14.2 Curtis KA, Black K. Shoulder pain in female wheelchair basketball players. Journal of Orthopaedic & Sports Physical Therapy. 1999. Vol, 29N No 4, pp. 225–231. ↑ Wilson PE, Washington RL. Pediatric wheelchair athletics: Sports injuries and prevention. Paraplegia. 1993. Vol 33, pp. 330-337. ↑ 17.0 17.1 17.2 17.3 17.4 17.5 17.6 17.7 17.8 17.9 Conchar L, Bantjes J, Swartz L, Derman W. Barriers and facilitators to participation in physical activity: The experiences of a group of South African adolescents with cerebral palsy. Journal of health psychology. 2014 Mar 6:1359105314523305. ↑ Jones DB. “Denied from a lot of places” barriers to participation in community recreation programs encountered by children with disabilities in Maine: perspectives of parents. Leisure/Loisir. 2003 Jan 1;28(1-2):49-69. ↑ 20.0 20.1 20.2 20.3 20.4 Shields N, Synnot A. Perceived barriers and facilitators to participation in physical activity for children with disability: a qualitative study. BMC pediatrics. 2012 Jan 19;16(1):1. ↑ Jaarsma EA, Dijkstra PU, de Blécourt AC, Geertzen JH, Dekker R. Barriers and facilitators of sports in children with physical disabilities: a mixed-method study. Disability and rehabilitation. 2015 Aug 28;37(18):1617-25. ↑ 22.0 22.1 22.2 Shields N, Synnot A. 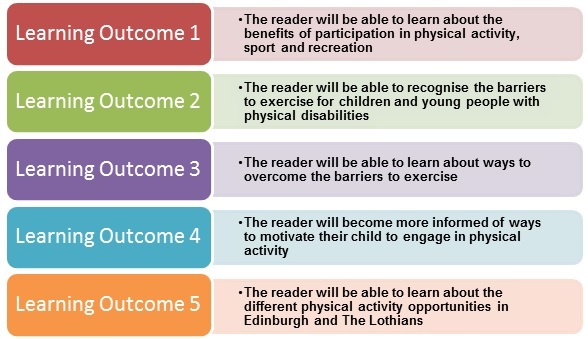 Perceived barriers and facilitators to participation in physical activity for children with disability: a qualitative study. BMC pediatrics. 2016 Jan 19;16(1):1. ↑ Rimmer JH, Riley B, Wang E, Rauworth A, Jurkowski J. Physical activity participation among persons with disabilities: barriers and facilitators. American journal of preventive medicine. 2004 Jun 30;26(5):419-25. ↑ 24.0 24.1 Lauruschkus K, Nordmark E, Hallström I. “It’s fun, but…” Children with cerebral palsy and their experiences of participation in physical activities. Disability and rehabilitation. 2015 Feb 13;37(4):283-9. ↑ Moore LL, Lombardi DA, White MJ, Campbell JL, Oliveria SA, Ellison RC. 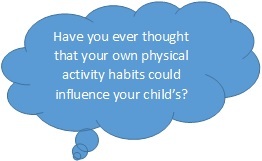 Influence of parents' physical activity levels on activity levels of young children. The Journal of pediatrics. 1991 Feb 28;118(2):215-9. ↑ Trost SG, Sallis J, Pate R, Freedson P, Taylor W, Dowda M. Evaluating a model of parental influence on youth physical activity. Am J Prev Med. 2003;25:277–82. doi: 10.1016/S0749-3797(03)00217-4. ↑ Dowda M, Dishman RK, Pfeiffer KA, Pate RR. Family support for physical activity in girls from 8th to 12th grade in South Carolina. Preventive medicine. 2007 Feb 28;44(2):153-9. ↑ Rosenbaum P, Gorter JW. 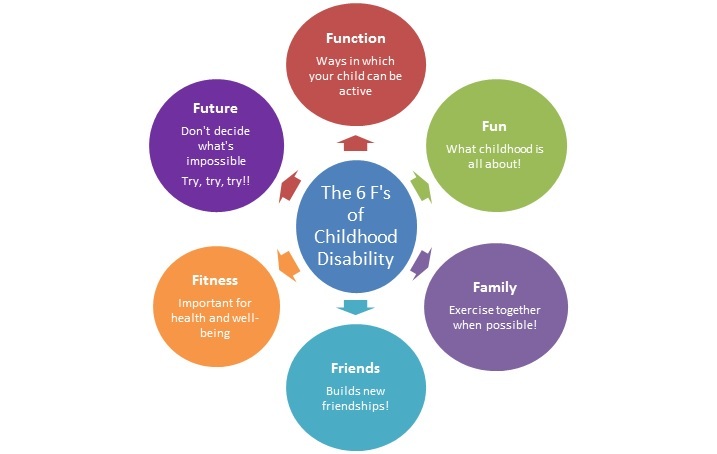 The ‘F‐words’ in childhood disability: I swear this is how we should think!. Child: care, health and development. 2012 Jul 1;38(4):457-63. References will automatically be added here, see <a href="Adding References">adding references tutorial</a>.